Pima County offers a variety of group swim lessons during the summer swim season at eight County pools. Swim lessons at the Thad Terry pool are taught through the YMCA. Please call 520-229-9001 for information on swim lessons and fees at this location. Lessons cost $20.00 for a two-week session (8 classes). Please see below information on opportunities for free swimming lessons. Registration: You can register for lessons 24 hours a day, 7 days a week from the comfort of your home or any public computer. Simply create an account and you will be all set up to register for the lessons when registration opens. Unable to register online? Please contact Jodi Layton at 520-724-5171 for assistance or any questions. Please note that calling the provided assistance number does not guarantee registration into a class. Online registration for all swim lessons/sessions at each pool offering the program starts on May 14, 2019 at 6:00 a.m. Arizona time. Registration ends at midnight on the Wednesday before the start of each session. See below registration dates and registration deadlines. Due to program capacity, all pools limit total registration. Many pools sell out each summer, so make sure to register early. NEW Pool specific registration information! Flowing Wells Pool - TMC Vest it Up! Kino Pool - TMC Vest it Up! Los Niños Pool - TMC Vest it Up! For ages 18 months to 3½ years old, and must have an adult in the water with them. This introductory child swim class is where parents are taught how to help their child become comfortable in the water by: Getting face wet and blowing bubbles, floating on back, jumping in and submerging, locomotion on front and back with kicking and pulling. Although this class is extremely beneficial to comfort ability of a child in the water, this class is not a prerequisite for Starfish Swim Lessons. Please click on the above pool flyer for pool specific registration information for StarBabies/StarTots. Note: Each child's swimming ability will be assessed on the first day of class of each session and then placed into a stage that will best benefit the child. Group swimming lessons for children ages 3½ and up who can participate without parental presence. In groups of 6 or less per instructor, children will be taught a wide variety of swimming skills depending on which stage they are assigned after the skills assessment on the first day of class. 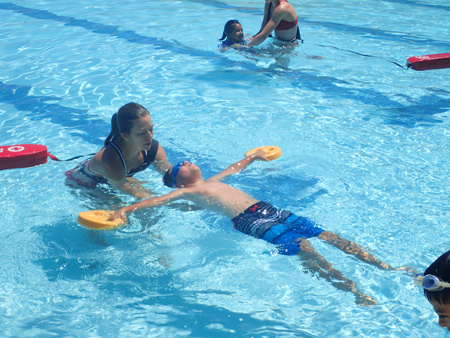 This program focuses on the fundamentals of learning to swim and safety around water. 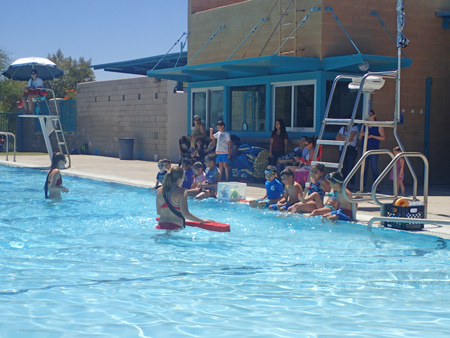 Pima County offers swim stroke development in the form of a novice swim team program. Please click on the above pool flyer for pool specific registration information on Starfish Swim Lessons. Pima County currently works with both Tucson Medical Center’s Vest It Up! Program, and the Parklands Foundation to offer a limited number of free swim lessons each summer. Qualifying families may register (free of cost) for these programs online starting May 14, 2019 at 6 a.m. Arizona time. Free registrations are available on a first come. Please click on the above pool flyer for pool specific registration information for these free swim lessons.